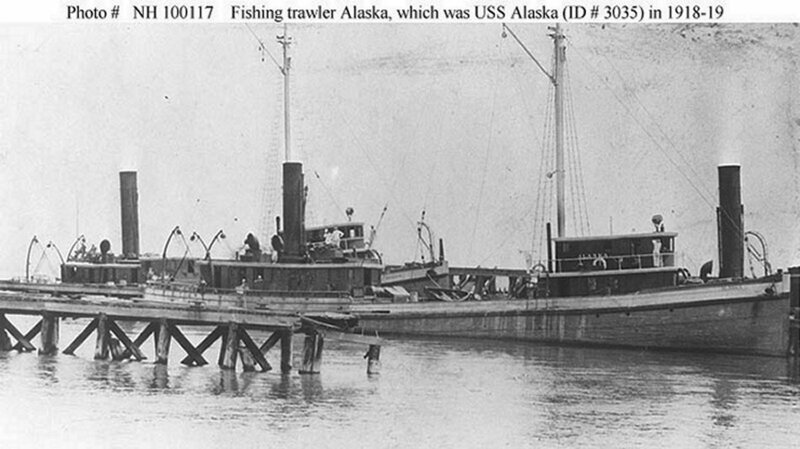 Fishing Trawler: Built in 1881 at Boothbay, ME; Acquired by the Navy 18 September 1918 and commissioned the same day at the Charleston Navy Yard; Decommissioned, (date unknown); Returned to her owner, the Fisheries Produets Co., Wilmington, NC, 10 January 1919 and her name was struck from the Naval Register. Fate unknown. Specifications: Displacement 229 t.; Length 141' 9"; Beam 21'; Draft 10' 6"; Speed 10 kts. ; Complement 27; Armament unknown. 100k Photographed prior to her World War I Naval Service. Dictionary of American Naval Fighting Ships History: The second Alaska (Id. No. 3035) - a steam-powered fishing trawler built in 1881 at Boothbay, Maine—was chartered by the Navy from the Fisheries Products Co., Wilmington, N.C. on 18 September 1918 and commissioned at the Charleston Navy Yard that same day. Converted for service as a minesweeper, she served in the Charleston area for the remainder of World War I and briefly thereafter. She was returned to her owner on 10 January 1919; and her name was struck from the Navy list that same day.